Marybong Tea Estate has 140 Springs of history to be written and related to all tea lovers across the globe. The name Marybong is derived from the Lepcha language (A local dialect) which means “Mary’s bong’ meaning Mary’s place. Originally it was known as the Kyel Tea Estate when it was established in 1876 by Louis Mandelli. 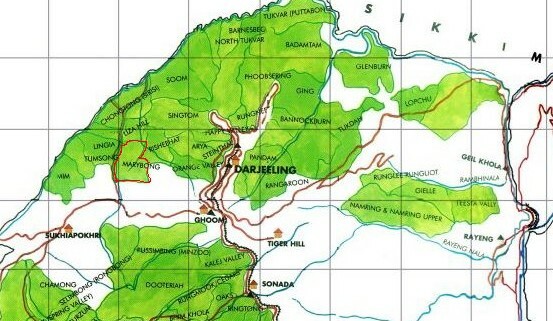 Marybong was tea division of the adjoining Lingia Tea Estate (now owned by the Chamong group). It was after the merger of this tea division with Kyel Tea Estate, that it was renamed as Marybong Tea Estate. The nearest town is Ghoom located at a mere distance of 10-12 kilometers apart. The nearby tea estate are Tumsong Tea Estate and Lingia Tea Estate in the west, Liza Hill Tea Estate in the north and Rishihat Tea Estate in the east. This tea estate has a total area of about 400 hectares out of which 285 hectares are used for tea production. Ideally located at an altitude between 2900 feet and 5900 feet to produce some of the best teas from the region which is capable of producing high grade teas of about 200,000 kilogram annually. Darjeeling teas produced from this tea estate is primarily from china tea bushes and are orthodox Darjeeling tea which has flowery aroma and unique flavor. The most popular tea to come from this tea estate is the flowery teas from first flush which has some distinct magic even though they are produced from pure China cultivar. The ownership of Marybong Tea Estate (Kyel Tea Estate) many a hands during its 140 or so years of existence. Soon after its establishment, it was acquired by Mr Evandeon and his associates in the year 1880 who managed this garden till 1955. From 1956 till the mid 2005, this garden witnessed the managerial skills of the Duncan Brothers. At present, Marybong tea estate is owned by the Chamong group of the Lohia’s who also manages other tea gardens of Darjeeling, viz., Chamong Tea Estate, Pussimbing Tea Estate, Tumsong Tea Estate, Lingia Tea Estate, Soom Tea Estate , Nagari Farm Tea Estate, Dhajea Tea Estate , Phoobsering Tea Estate, Bannockburn Tea Estate, Takdah Tea Estate, Ging Tea Estate and Sri Dwarika Tea Estate.